It's two weeks to my first competition of the season and I don't feel as ready as I have in the past. I've been working very hard in the family retail business—I've worked every day the store has been open this year, that's six days per week for four months straight minus a few holidays. The day of the Mt. Tamalpais competition will be the first day off during hours of operation. While I play at least a few minutes every day on a practice chanter—and often only a few minutes—the full set of pipes has been averaging only once or twice per week. 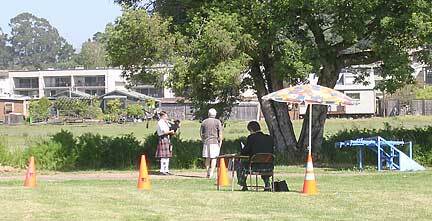 I have been really burnt out as a result of work and it's been affecting both my time and inclination to bagpipe. My instructor, Jay Salter, is in grad school this past school year and I've had only a few lessons this year. I have managed to learn a new 2/4 march (Balmoral Highlanders), but again with very little metronome work and a new slow march (Banks of Lochiel a.k.a. Braes of Lochiel)—both of which have been recently added to the band's repertoire. While I've been tempted to learn a new piobaireachd, I've opted to stick with the same one due to time constraints. On a side note, my grandfather (dad's dad) turned 98 yesterday. Good genes. I'm starting to get into the spirit of competing next week though I haven't piped since last week. (At least a little practice chanter every day though remember.) A sorry state of affairs for getting ready for competition, but if I can drag myself out of bed early enough tomorrow, I'll pipe before work. I really need to get my chops up. (After work piping has been a challenge this past week with all my family and other obligations—Nicholas' Little League games, relative visits, etc.) I bought an iPod Shuffle ($69) with piping in mind and loaded it with a version of my each of competition tunes—ok, yes, there's some other music on there too! 10 days and counting . . . I was talking to my cousin at work today and told him that we'd have to see how I would do tomorrow as I felt I was playing my 2/4 March worse than I was two weeks before. Hmmm. One of my first thoughts this morning, waking up when it was still somewhat dark was "why am I doing this?" and "maybe it's getting time to pack it in for competition." And maybe it is. Or maybe I'm just burnt out from work and all the demands on my time right now. Or the fact that I woke up 4-5 times last night knowing I had to get up early! I was on the road at 7:03 a.m., bound for Marin County. I remembered to take the correct highway this year and it took me through San Francisco proper and onto the Golden Gate Bridge. That bridge is really a sight to behold, it's a behemoth. 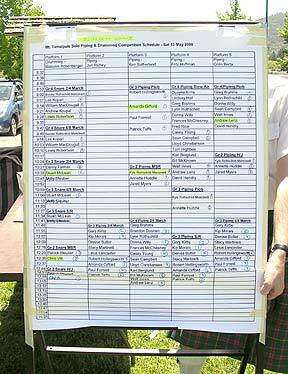 Traffic was moving well and I arrived at the competition location, Larkspur's Piper Park, at about 8:35 or so. I'm going to have to e-mail the Macintosh Band some clarifications to their on-line directions—there is a short street completely missing and a spot that reads as a right when it should be a left. Regardless, I did manage to get there without asking for directions from an innocent bystander. A typical view of the registration tent. It was rarely sparse. 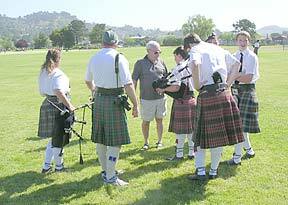 I walked around and greeted a number of pipers, including Paul Forrest who was organizing the contest. Weather was nice. Sunny, but not overly hot with a slight breeze. This games was the first games in probably six years that I've played with a bag cover. 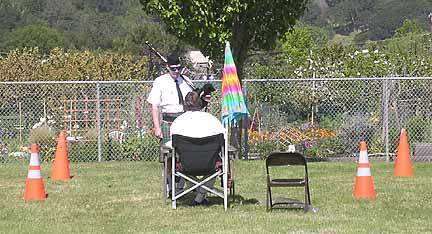 Santa Cruz Pipes & Drums plays without covers on almost exclusively L&M hide bags. I've had a really nice cover from bagpipecovers.com for a couple of years and I figured it was time to crack it out. (I had 2-3 positive comments on it.) That and I played with my vest for the first time where I wasn't required to wear it for band. I would have looked pretty spiffy—except I realized hours later that I had forgotten to snug up my tie! Oops. My first event, piobaireachd, was scheduled at 9:35 at Platform 5 with Colin Berta. Seven pipers signed up and I was to play next to last. I was all warmed up, though I was having a hard time getting the drones to lock in. I had adjusted the chanter tape on E and also taped down F a bit. I really need to get that new chanter reed going. Platform 5 was literally right next to a walking path around the park. After giving the judge my tune, I was about to strike in the pipes just outside the cones on the path when the steward instructed me to stay on the grass. Sure enough there was a mother and child up the path on their way. I tuned up the pipes as best I could, though I still wasn't 100% happy with them. I'm really going to need some work on the blowing, tuning, chanter combination—and I suspect my chanter reed is still a likely culprit. I can perfectly tune the three drones to each other with no chanter engaged, but once the chanter enters the equation, it's more difficult. I played the tune solidly, no mistakes—no wandering off the tune, no chokes, etc. and also slowed down at the end of phrases for expression. Aside from the tuning not being exactly where I wanted it to be, I was satisfied with my performance. in trying to blow Low A to suit though. to get pipes settled. Good show. I have to admit, I was a touch disappointed with 3rd—heck, I took 1st at Mt. Tam last year. But, since I played well, I was happy enough. I guess I should have asked Colin at the workshop after the competition what exactly knocked me down, but seems tuning was probably the difference. Walt Innes (who couldn't make it to Mt. Tam last year) took 2nd. Sean Campbell took 5th Place. Sean Campbell gets a post-performance chat with Fritz Hoffman on the finer aspects of Slow March. The next event was the Slow March. Fritz Hoffman, who judged my piobaireachd last year, was at Platform 3 for my 10:38 time. I was to play next to last out of the sixteen pipers who signed up. The routine was similar to the piobaireachd. Tuned, not super happy, but it was the best I could do at the time. I played the tune, no mistakes. Fritz is one of those judges who keeps a practice chanter (PC) at his table to point out areas for improvement in the competitor's performance tune. The PC didn't come out like last year. We did talk about my website and my drone sound and make of pipes for about a minute, but that was it. Walt Innes and I hung out for a while waiting for the piobaireachd and slow march results. making you change your blowing to compensate. T+E: Very nice fingers. Sometimes feeling you were careful. [X] Level 4: The competitor has demonstrated proficiency likely to be in the upper quartile of this grade level. From the comment about straying from the beat, one could say I was playing the tune more as a slow air than a slow march. I was happy enough with 3rd in the slow march, it was an improvement over 5th last year. That's me, Mr. Cut-Throat Competitor, happy with something other than 1st place. (If you've read my previous journals you know I'm being facetious about being cut-throat!) Sean Campbell took 2nd and Walt Innes took 4th place—now, this set up an interesting dynamic. 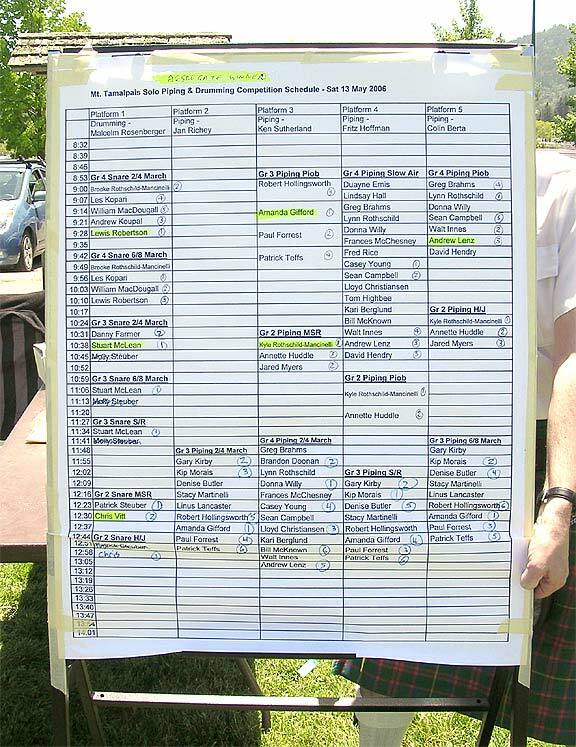 The first place winner in piobaireachd didn't place in the slow march and vice versa. This meant that going into the final event, the 2/4 March, only Sean, Walt, and I had a chance to win the Grade IV aggregate medal. The three of us laughed about it a bit. We see each other every year on the "circuit," so it's not like we're strangers. Bill Merriman surrounded by a gaggle of pipers. Off in the distance to the left is a soccer game. Later in the day, it was supplanted by a cricket game. Yes, cricket! After Fritz' comment on the upper hand being sharp, I knew I was going to have to play around with the chanter tuning. I tried pulling the reed out of bit to drop the top hand, but it made the High-A even flatter than it was already, so that was ruled out. I pushed the reed back in and taped the holes down a bit more as needed. A piper by the name of Casey Young introduced himself and said some nice things about this website. Casey won the Slow March and later took 4th in the 2/4 March. I had a few of other pipers stop me to say "thanks" or otherwise say positive things about BagpipeJourney.com. That's always fun. Kip Morais finally arrived (he'd skipped piobaireachd)—with very long curly locks—I didn't recognize him at first! He was a bit unsure of how he would do as this was his first competition in Grade III. He'd competed in Bakersfield on April 1st in Grade IV, but judge Aaron Shaw (of the Wicked Tinkers) told him he should get out of Grade IV and move up. Kip later went on to take a 1st, 2nd and 3rd in the events he entered. Yes, he doesn't belong in Grade IV! And speaking of advancing pipers, Amanda Gifford, who cleaned up in Grade IV last year, is also cleaning up in Grade III this year. She took three first places out of four events and won Grade III aggregate. Her dad, Gary Gifford, told me via e-mail a couple weeks ago that Amanda had also taken aggregate at a contest earlier this year. Ken Sutherland enjoys his umbrella while judging a Grade II event. Bill Merriman and student await their turn. Ken Sutherland was judging the 2/4 March at Platform 3. I was scheduled to play at 1:05, but things were running a few minutes ahead. I gave the judge my tune, struck in, checked the tuning and away I went. And away I did go. Too fast! I can play this particular tune on a PC reasonably well quickly, but the pipes are a different animal, the anatomics are different. Hmmm, just occurred to me. I wonder if it would help to practice playing a PC while squeezing/hold a pillow with your left arm. I wonder if anyone has ever tried that—of course, you could always just use a goose. (For the uninitiated, a goose is a pipe bag hooked up to the bottom half of a practice chanter.) Anyway, the technique was hit or miss. Some was good, some was bad—periodic overlapping doublings, crushed this and that. I did stay on the tune and had no chokes. Ken invited me over to his table. I volunteered that I'd played it too fast. He commented that the drones sounded nice, if not tuned that well. I told him what I believe the make to be of my drones as well as the brand of drone reeds. On a positive note, he said my tempo stayed even throughout. Then out came the PC. He played the first line of the tune correctly a bit slower then demonstrated an exaggerated version of how I had played it, flubs and all. He also went over the third part. Drat. I'd really messed that up in terms of technique. It was so subpar compared to how I'd practiced it. Kip and his mother asked how I thought it went. I told them I'd played it too fast and messed up the embellishments as a result. They said it sounded pretty good from their vantage point—about thirty to forty feet away. I said, "It'd take a miracle to pull a placing out of that." They seemed to think my performance was better than a number of others that they had heard. Well, we'd just have to see. It wouldn't be long, since I was last to play. Pipes sound very nice - but not tuned well. made your technique fall apart somewhat. competition that isn't so demanding. Well, I did manage to eke out a fifth. That would almost assuredly garner me the Aggregate Prize—and yes, it did. Better than a kick in the head though I'd trade it in a heartbeat for a worthy gold medal performance in 2/4 March! The final standings on the schedule. Paul Forrest has his hand poised and ready to take down the easel. 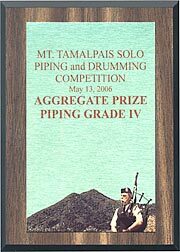 They'd highlighed the aggregate winners for pipers and drummers in their respective grades. At just about 5 p.m., just in time for Saturday rush hour traffic, I was on the road headed back to Santa Cruz. I was able to drive very, very slow—occasionally stopped—over the Golden Gate. Traffic sped up once I was through San Francisco and onto 280 South. I was home about 10 minutes to 7 p.m.—a long 12 hours. So for the day, I wish I could say that I'm satisfied, but truth be told, there's work to do. I could pat myself on the back for the Aggregate, but I'm capable of better. The big work is tuning. And I really need do need to get a new chanter reed working. I also need to bite the bullet and start marching for the 2/4 in competition. Onward and upward. I hope!